You’re looking to sell your home, but you know it’s also about time for a new roof. Many sellers question whether or not to get their roof fixed before putting their house on the market. We’ve put together this guide on roof replacements and repairs. You might be tempted to hold off on repairs in the hopes that potential buyers won’t notice. However, you’ll likely end up having to make up for the cost by lowering your asking price by thousands of dollars, so skipping repairs probably won’t save you much money in the long run. Before you decide whether you want to throw thousands of dollars into roof replacement, first consider whether the roof can merely be repaired. If your roof has a few broken shingles or damage in one particular area, you might benefit from minor repairs or only partial replacement. Contact a roofer for an estimate. Small repairs might save money while also increasing your home’s value. If your home has severe roof damage — especially if it leaks — you’ll want to consider complete replacement. Buyers need to meet numerous requirements to be eligible for loans. One of these requirements dictates that the roof can’t leak and the roofing material still has at least two years of life left, so a damaged roof can prevent someone from buying your house at all. Maybe your roof isn’t great, but it isn’t terrible, either. Perhaps you simply don’t have the money for repairs. 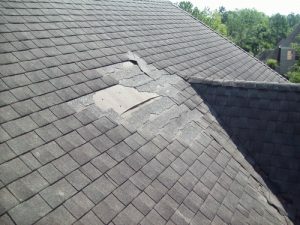 If the roofing material is still within its lifespan and there’s no severe damage, you might consider hiring an inspector to perform maintenance service and assess the roof’s condition. While most experts agree that repairing or replacing a roof before selling is usually in your best interest, an inspector can tell you whether or not repairs are necessary. You might find that your roof is fine to sell as-is. Sometimes an inspector can even certify your current roof for a few more years of additional lifespan, which can help in negotiations and can give you peace of mind if you can’t afford repairs. Even a damaged roof deserves to look its best and stay protected. Keep your roof clean by clearing off any branches or debris, and clean the gutters to allow water to drain. Also regularly assess moisture levels, ventilation and other vital factors in your roof’s longevity. When you want to sell a home with a bad roof, or if you need tips on whether or not to repair your roof, you need a real estate agent who knows how to help. If you live in the York region, Contact CENTURY 21 Core Partners today. We’ll help you secure a knowledgeable agent who will work with you to sell your home.